NEW: Obama says F-22 vote "would have been an inexcusable waste of money"
WASHINGTON (CNN) -- The Senate voted Tuesday to block expansion of one of the country's most controversial and expensive defense programs, the F-22 fighter jet program. 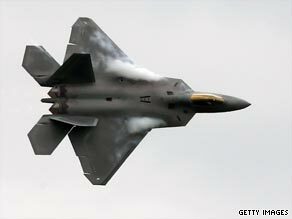 The Senate voted Tuesday to cut $1.75 billion for an additional seven F-22s from the fiscal year 2010 budget. The vote gave the White House and Pentagon a key victory over congressional supporters of the F-22, many of whom represent states and districts where jobs are tied to the production of the jet. The vote, which stripped $1.75 billion for an additional seven F-22s from the fiscal year 2010 budget, was a reversal of an earlier Senate committee decision to include money for the program. The change came in a response to strong pressure from President Obama, Defense Secretary Robert Gates and several key senators who argued that the additional planes are not needed or wanted by the military. The 58-40 vote, which did not break down along typical partisan lines, was the culmination of a classic confrontation between the president and Congress over who is the best judge of the country's military needs. "Every dollar of waste in our defense budget is a dollar we can't spend to support our troops or prepare for future threats or protect the American people." Under the 2010 budget proposed by Gates, production of the F-22 would be halted at 187 planes. The Pentagon instead wants to produce 500 of the more modern F-35 planes over the next five years and 2,400 over time. The decision was met with strong opposition in Congress. With the F-22 being manufactured in or getting supplies from 44 different states, the plane gets broad support from congressmen and senators on both sides of the aisle. One of the leading proponents for keeping the F-22 program is Sen. Saxby Chambliss, R-Georgia, whose state is home to the factory that assembles the jet. On Tuesday, Chambliss defended his support, arguing that Congress should not just rubber stamp spending decisions by the Pentagon. "Our interest and involvement in these issues is appropriate and not just based on parochial issues," Chambliss said. Underscoring the drama, Obama threatened to veto the entire defense budget if it included money for the F-22. Chambliss noted that there has been a "flurry" of lobbying by the White House and Defense Department. "I've never seen the White House lobby like they've lobbied on this issue," Chambliss said. "It's been unparalleled." Sen. John McCain, R-Arizona, also acknowledged the intensity of the dispute during the final Senate debate. "This amendment is probably the most impactful amendment that I have seen in this body on almost any issue, much less the issue of defense," McCain said on the Senate floor. "It really boils down to whether we're going to continue [the] business as usual of once a weapons system gets into full production it never dies, or whether we're going to take the necessary steps to really reform the acquisition process in this country." The Lockheed Martin jet has never been used in Afghanistan or Iraq, but supporters contend it is needed to fight more sophisticated enemies who might confront the United States in the future, such as China or Russia. They also note the thousands of jobs that will be lost if the F-22 program is halted. "We put that many jobs at risk, not because the industry is failing, not because it is a bad piece of aircraft, but because the secretary of defense and the administration have decided this program isn't worthy of our support. So explain to those 90,000 people, once they lose their jobs and get laid off," said Democratic Sen. Christopher Dodd. The F-22 engine is made in Dodd's home state of Connecticut. "Terminating production, like closing a base, involves economic loss for communities involved," Levin said. "But we must do so from time to time, and make these difficult decisions based on what is best for the nation and what is best for the men and women of the armed forces." Gates has maintained that more jobs will be created in F-35 production than will be lost in stopping the F-22. He said 11,000 jobs will be lost by halting the F-22, while it is anticipated that 82,000 jobs will be created by the F-35. Gates said Monday he'd heard no "substantive" argument for keeping the jet for national security reasons, pointing out that China has no planes that can compete with the more than 1,000 advanced fighter jets the U.S. will have by 2020. Gates said that the gap between the two countries' aerial arsenals will only widen.